Welcome to my eleventh post of In My Mailbox! Hosted by The Story Siren, it is a way to showcase books received for review or won, picked up at the library, or purchased in the last week (or two). Titles link to Goodreads. This past week I have been really busy with Armchair BEA, and went traveling to visit family over the holiday weekend. However, I did receive one book. One very, very special book. It is not only special because of the author, who I admire greatly as a knitter, but because this is going to result in some firsts for me. I have in my hands a copy of Teach Yourself Visually: Circular Knitting by Melissa Morgan-Oakes. This is Melissa's third book, and while I still haven't gotten my way to actually finishing one sock (much less two-at-a-time) I will have the honor and pleasure of interviewing Melissa later in June as the first stop on her first blog tour, in addition to reviewing the book. 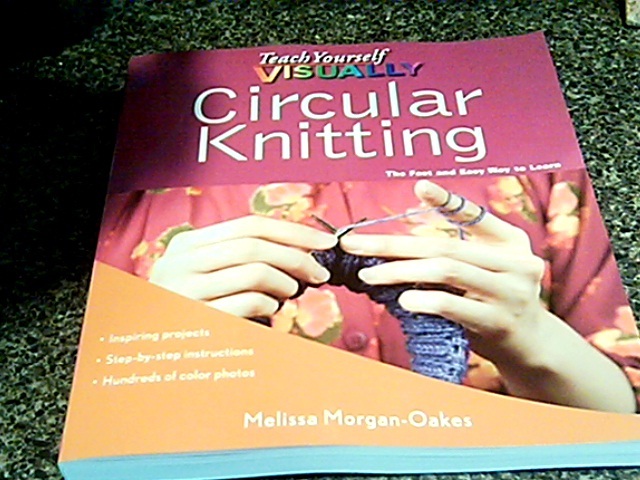 I enjoy circular knitting--and visual learning--myself, so I am finding this book not only instructional but inspirational. Melissa was gracious enough to not only provide an autographed copy for me (MINE!) but one for YOU! Yes, I will be hosting my first ever giveaway on the blog for an autographed copy of Teach Yourself Visually: Circular Knitting for one lucky reader. Stay tuned. Ebooks in Libraries: Is It Common Sense?